Avebury is the site of a large henge and several stone circles in the English county of Wiltshire surrounding the village of Avebury. It is one of the finest and largest Neolithic monuments in Europe dating to around five thousand years ago. It is older than the megalithic stages of Stonehenge, which is located about 32 km (20 miles) to the south, although the two monuments are broadly contemporary. Theories of the purpose of these monuments continue to be developed and debated. When Christianity took over as the dominant religion, many of the stones were destroyed in fear of the pagan rituals that were carried out there. Today, however, pagan festivals have returned, celebrated by many who consider it a center of spirituality. While many are attracted simply as tourists, marveling at the immense stones, others find a connection to the spiritual world in this ancient setting. Avebury is a National Trust property. Together with Stonehenge, Avebury was designated a World Heritage Site in 1986. Avebury is the site of a large henge and several stone circles, dating to around 5000 years ago. A massive ditch and external bank henge 421 meters in diameter and 1.35 kilometers in circumference enclose an area of 115,000 square meters (28.5 acres). 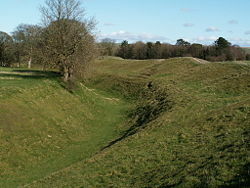 Most of the surviving structure consists of earthworks, known as the dykes. The only known comparable sites of similar date (Stonehenge and Flagstones in Dorset) are only a quarter of the size of Avebury. Research has shown that the megalithic stones were obtained from the same place, the nearby Marlborough Downs. The ditch alone was 21 meters wide and 11 meters deep, with its primary fill carbon dated to between 3400 and 2625 B.C.E. Excavation of the bank has demonstrated that people enlarged it at one stage in its lifetime, presumably using material excavated from the ditch. The fill at the bottom of the final ditch would therefore post-date any in an earlier, shallower ditch that no longer exists. Within the henge is a great Outer Circle constituting prehistory's largest stone circle with a diameter of 335 meters (1,100 feet). It was contemporary with or built around four or five centuries after the earthworks. There were originally 98 sarsen standing stones some weighing in excess of 40 tons. They varied in height from 3.6 to 4.2 meters as exemplified at the north and south entrances. Carbon dates from the fills of the stoneholes date between 2800 and 2400 B.C.E. Nearer the middle of the monument are two other, separate stone circles. The Northern inner ring measures 98 meters in diameter, although only two of its standing stones remain with two further, fallen ones. A cove of three stones stood in the middle, its entrance pointing northeast. The Southern inner ring was 108 meters in diameter before its destruction. The remaining sections of its arc now lie beneath the village buildings. A single large monolith, 5.5 meters high, stood in the center along with an alignment of smaller stones, until their destruction in the eighteenth century. There is an avenue of paired stones, the West Kennet Avenue, leading from the south eastern entrance of the henge, and traces of a second, the Beckhampton Avenue, lead out from the western one. Aubrey Burl conjectured a sequence of construction beginning with the North and South Circles erected around 2800 B.C.E., followed by the Outer Circle and henge around two hundred years later and the two avenues added around 2400 B.C.E. A timber circle of two concentric rings, identified through archaeological geophysics possibly stood in the northeast sector of the outer circle, although this awaits testing by excavation. A plowed barrow is also visible from the air in the northwestern quadrant. The henge had four entrances, two opposing ones on a north by northwest and south by southeast line, and two on an east by northeast and west by southwest line. Despite being a man-made structure, it was featured on the 2005 television program Seven Natural Wonders as one of the wonders of the West Country because it consists of natural components. A large part of the small village of Avebury, complete with public house, and a small library and museum containing artifacts found at the Avebury site, the Alexander Keiller Museum, are enclosed within the monument. Two local roads intersect within the monument, and visitors can walk on the earthworks. The two stone avenues (Kennet Avenue and Beckhampton Avenue) that meet at Avebury define two sides of triangle that is designated a World Heritage site and which includes The Sanctuary, Windmill Hill, Silbury Hill, and the West Kennet Long Barrow. Many of the original stones were destroyed from the early fourteenth century onwards to provide local building materials and to make room for agriculture. The stones were also destroyed due to a fear of the pagan rituals that were associated with the site. Both John Aubrey and, later, William Stukeley visited the site and described the destruction. 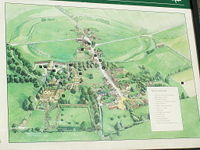 Stukeley spent much of the 1720s recording what remained of Avebury and the surrounding monuments. Without his work we would have a much poorer idea of how the site looked and especially little information on the inner rings. By the beginning of the Victorian period, the majority of Neolithic standing stones at Avebury had gone. Meanwhile, the population of Avebury village was rapidly increasing, leading to further housing being built inside the henge. In an attempt to prevent further construction on the site, the wealthy politician and archaeologist Sir John Lubbock, who later came to be known as Lord Avebury, purchased much of the available land in the monument, and encouraged other buyers to build their houses outside rather than within the henge, in an attempt to preserve it. In the 1930s, Alexander Keiller carried out excavations at Avebury. He decided that the best way to preserve the monument was to purchase it in its entirety, and he also obtained much of the Kennet Avenue as possible. 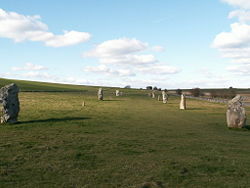 Only 27 stones of the Outer Circle survive and many of these are examples re-erected by Keiller. Concrete markers were placed in the former locations of the missing stones, and it is likely that more stones are buried on the site. The possibility of digging up and re-erecting these stones has been under consideration. Excavation at Avebury itself has been limited. Sir Henry Meux put a trench through the bank in 1894, which gave the first indication that the earthwork was built in two phases. The site was surveyed and excavated intermittently between 1908 and 1922 by a team of workmen under Harold St George Gray. He was able to demonstrate that the Avebury builders had dug down 11 meters into the natural chalk in excavating the henge ditch, producing an outer bank nine meters high around the whole perimeter of the henge and using red deer antler as their primary digging tool. Gray recorded the base of the ditch as being flat and four meters wide, although some later archaeologists have questioned his use of untrained labor to excavate the ditch and suggested that its form may have been different. Gray found few artifacts in the ditch fill but did recover scattered human bones, jawbones being particularly well represented. At a depth of about 2 meters, Gray encountered a complete skeleton of a woman only 1.5 meters (less than five feet) tall who had been buried there. Alexander Keiller began excavations at Windmill Hill, his work proving that the site was a causewayed enclosure, and it became the monument type-site for decades afterward. 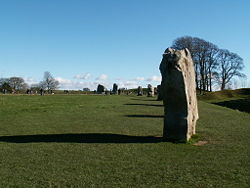 In 1934, he began a two-year excavation of the West Kennet Avenue, which led south east from the Avebury stone circle. As he discovered buried stones, he had them re-erected, and marked the stone-holes with pillars. 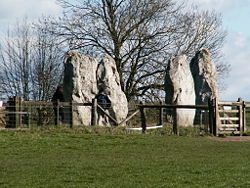 Keiller began a major excavation at Avebury in 1937, the first of three seasons over the ensuing years. Each concentrated on a quadrant of the circle, clearing undergrowth, restoring and conserving the site. Buried stones, some up to a meter below ground, were uncovered and replaced in their original stone-holes. As with the avenue, he placed concrete pylons to denote missing stones. In 1938 he discovered the famous barber surgeon of Avebury skeleton in the south west quadrant. Keiller opened a museum that year, to display finds from the Windmill Hill, West Kennet, and Avebury excavations. The Second World War ended the excavations and in 1943, Keiller sold his holdings in Avebury to the National Trust. When a new village school was built in 1969 there was limited further opportunity to examine the site. An excavation to produce carbon dating material and environmental data was undertaken in 1982. A great deal of interest surrounds the stones at the monument, which are often described as being in two categories; tall and slender, or short and squat. This has led to numerous theories relating to the importance of gender in Neolithic Britain with the taller stones considered 'male' and the shorter ones 'female'. The stones were not dressed in any way and may have been chosen for their pleasing natural forms. Numerous people have identified what they claim are carvings on the stones' surfaces, some carvings being more persuasive than others. The human bones found by Gray point to some form of funerary purpose and have parallels in the disarticulated human bones often found at earlier causewayed enclosure sites. Ancestor worship could have been one of the purposes of the monument, and would not have been mutually exclusive of any male/female ritual role. The henge, although clearly forming an imposing boundary to the circle, had no defensive purpose as the ditch is on the inside. Being a henge and stone circle site, astronomical alignments are a common theory to explain the positioning of the stones at Avebury. It has been suggested that the bank of the henge provides a uniform horizon by which to observe the rising and setting of various heavenly bodies. Additionally, less well evidenced theories relating to aliens, ley lines, crop circles and the lost wisdom of the ancients have been suggested. As with Stonehenge, the lack of modern excavation work and reliable scientific dating make studying and explaining the monument difficult. Various legends have been attached to Silbury Hill, part of the Avebury complex, which is the tallest prehistoric man-made mound in Europe. Folklore has claimed it to be the burial place of an otherwise forgotten King Sil (or Zel); of a knight in golden armor; and even of a solid gold horse and rider. It is also told that the Devil was going to empty a huge sack of earth on the town of Marlborough, but was forced to drop it here by the magic of the priests from nearby Avebury. According to William Stukeley, the top of the hill was dug into in 1723 and some bones were discovered together with an ancient bridle. The mound was again dug into in 1776 and in 1849. In 1967, excavations were undertaken by Richard Atkinson but neither burials nor any clue to the mound's meaning were discovered. Atkinson did learn, however, through radiocarbon analysis that the mound dates to around 2660 B.C.E. Further evidence from the remains of plants and insects indicated that the structure was begun during the first week in August, probably at the time of the Celtic festival of Lughnasadh (or Lammas) at the start of the harvest season. Silbury also appears prominently in Stukeley's drawing of the great stone serpent of the Avebury complex. The very top of the mound can also be discerned from the village of Avebury in what has been described as a precise geomantic relation with the so-called 'Obelisk' in the Avebury complex. It can be seen, however, only after the crops in the intervening field on the horizon have been harvested; the standing grain is sufficient to obscure the view. For some, this is further evidence for interpreting the mound in connection with harvest festivals. Michael Dames has suggested that the hill is a symbolic effigy of the ancient Mother Goddess and is to be associated with fertility rituals which marked the course of the year. The festival of "Lugnasadh" (or Lammas) in August, when it is thought Silbury was founded, celebrates the first fruits of the harvest. 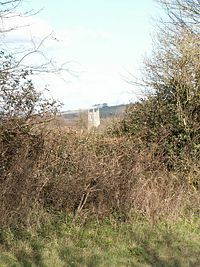 It has been pointed out that the spring which rises five hundred yards south of the hill and is the source of the River Kennet, was formerly called the Cunnit, a name which may be connected to the Mother Goddess and fertility. 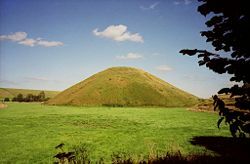 Another explanation argues that Silbury Hill could have been used as an accurate solar observatory by means of the shadows cast by the mound itself on the carefully leveled plain to the north, towards Avebury. The meridian line from Silbury runs through Avebury church which stands on a ley line running between Stonehenge and the stone circle at Winterbourne Abbas. The same ley line also passes through two churches and the eastern slope of Silbury. Silbury, in fact, is a center for alignments of straight prehistoric tracks, resurfaced by the Romans, and of standing stones. The Roman road between Marlborough and Bath runs directly towards Silbury Hill before swerving to avoid it. This indicates that the Roman road followed a pre-existing track or ley line. Avebury is seen as a spiritual center by many who profess beliefs such as Paganism, Wicca, Druidry, and Heathenry, and indeed for some it is regarded more highly than Stonehenge. The pagan festivals all attract visitors, and the summer solstice especially draws increasingly large crowds from the religious to the idly curious. As with Stonehenge, though, access is contested. While Avebury henge and circles are 'open' to all, access has been controlled through closure of the parking area. Pressure of numbers on this circle is an issue begging resolution, and various attempts at negotiation have been made. Avebury is increasingly important for tourism today, and how visitors relate to Avebury is part of the study of the Sacred Sites, Contested Rites/Rights project. The National Trust, who steward and protect the site (owned by English Heritage) are also actively in dialog with the Pagan community, who use the site as a religious temple or place of worship. This dialog takes place through the National Trust's Avebury Sacred Sites Forum. The project has a charter and guidelines for visitors, which helps to foster understanding between the Pagan community and the general public visiting the site. ↑ Lost skeleton of `barber-surgeon' found in museum British Archaeology 48 (October 1999) Retrieved August 19, 2007. ↑ Aubrey Burl, Prehistoric Avebury (New Haven, CT: Yale University Press, 2002, ISBN 0300090870), 55. ↑ Sacred Sites, Contested Rights/Rites project Retrieved August 18, 2007. Atkinson, R.J.C. "Neolithic science and technology." Philosophical Transactions of the Royal Society of London. Series A, Mathematical and Physical Sciences, 1974. Vatcher, Faith de M & Lance Vatcher. 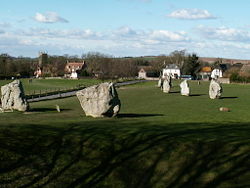 The Avebury Monuments. Department of the Environment HMSO, 1976. This page was last modified on 6 December 2016, at 17:12.